Huawei MediaPad M3 Lite 10 Review: Is it a good entertainment tablet? 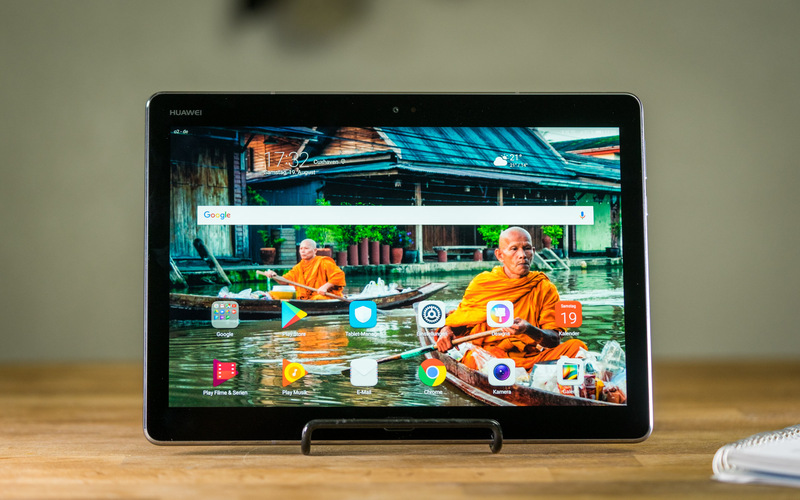 As my Huawei MediaPad M3 Lite 10 review shows, this tablet is great for watching Netflix. But is the performance good enough for everything else? The Huawei MediaPad M3 Lite 10 is a 10.1-inch Android tablet that wants to be the perfect entertainment device. On paper, it certainly has the specs for that. Its highlights are a full HD display and four integrated speakers. In addition to that, you can make phone calls and send text messages with the LTE version. How good is the MediaPad M3 Lite 10 in real life use? That’s what you’ll find out in this review. Once you unbox the Huawei MediaPad M3 Lite 10 you’ll immediately recognize that this is a Huawei tablet. Its design looks very similar to previous tablets from them. While there is nothing too special about the design, it does look quite nice. In fact, I like it a bit more than the designs from most similar tablets. You can get it in space gray, gold, and white. The build quality is not as good as the one from the 8.4-inch Huawei MediaPad M3 (review) but it is still good. While the body is not made out of one single block of aluminum, we are getting a nice metal frame. There is a small gap between the frame and back but that’s very common with devices in this price range. Over all, the design and build quality are good. It sits nicely in your hands without feeling uncomfortable at all. At the same time, it’s relatively thin at 7.1 millimeters. Around the 10.1-inch screen is a black bezel. There’s an 8-megapixel front facing camera above the display and underneath is a fingerprint reader. The fingerprint reader works as good as the ones from Huawei’s smartphones. You can unlock the tablet fast and easily. One of my favorite features is the build in gesture support. Once activated in the settings, you can use gestures on the fingerprint sensor to replace the home, back and recent button. Like I mentioned in the beginning, there are four speakers in total. On the top and bottom are two speakers each. As you might expect at this price point, the speakers are not the best in the world, but very good in this class. The sound quality is similar to the 2017 iPad (review) and noticeably better than the ones from the Lenovo Tab 4 10 Plus. Even though we are living in the year 2017, there is still no USB type C port. Instead, Huawei is still using the older micro USB 2.0 connector. You can use it to charge it or to connect accessories like USB sticks with an adapter. Above the port is a microSD card slot. If you’re getting the 4G version, then there’s the SIM card slot as well. On the exact opposite site are a power button and the volume controls. All the way on the top is a standard 3.5-millimeter audio jack. There’s an 8-megapixel camera on the back. So, the front and back facing cameras have the same resolution. They’re not outstanding at all but certainly fine for snapshots. The front camera is also very usable for video chats using Skype or other apps. The Huawei MediaPad M3 Lite 10 has a 10.1-inch display. It’s an IPS panel with a resolution of 1920 x 1200. Since it is a 10-inch screen, I think a full HD resolution is enough. Yes, you probably have a smartphone with a higher pixel density. But it’s still fine, most people won’t notice a real difference. Actually, I really like the display. It looks very nice, has wide viewing angles and colors look accurate and saturated. Pictures and videos look very nice on this display, better than on some other alternatives. There is one downside though. It is not the brightest screen out there. I used the tablet quite a bit outside and in direct sunlight, the brightness is high enough if you’ve got a bright background like in Microsofts Word. Otherwise, the screen transforms itself into a mirror. Well, it’s not too bad, but it could be a bit brighter. Let’s take a closer look at the internal hardware and the performance. Inside the MediaPad M3 Lite 10 runs a Qualcomm Snapdragon 435 SoC. While this is an octa-core chip, those eight cores are clocked at 1.4GHz only. My version has 3GB of RAM and 32GB of internal storage. The storage options vary a bit by country though. The Snapdragon 435 is a lower middle-class chip. As you might expect, the performance is not the best. I was able to play games like Asphalt Xtreme and Combat Squad very nicely but I had to turn down the graphic settings a bit. Otherwise, you might see some frame drops. I was also able to install Modern Combat 5 and GTA Vice City. But, for some reason, both games crash immediately after starting them. That’s not good. As you might have guessed, I wouldn’t recommend the MediaPad M3 Lite 10 as a gaming tablet. The benchmarks show that as well. In Geekbench 4 the tablet gets 660 and 2850 points. With the AnTuTu test, it gets a result of 46840 points. Very similar priced tablets like the Huawei MediaPad M3 and Lenovo Tab 4 10 Plus (review) get noticeably better results. If you don’t want to play heavy games constantly, the performance is fine though. I didn’t have any issues at all when browsing the web or working with Word. In fact, even the split screen view runs very smooth. You can use two apps side by side without any problems. It’s also good for watching YouTube and Netflix. And, thanks to its four speakers, that’s what this tablet is really for. On the MediaPad M3 Lite 10 runs Android 7.0 Nougat. On top of that runs the so called Emotion UI in version 5.1. That’s the own interface from Huawei. You’ll be very familiar with it if you have used a phone or tablet from them in the last couple of years. The design of the Emotion UI is actually customized quite heavily. But, obviously, all the important Android core features are still there. One of them is the split screen view so that you can use two apps side by side. Huawei did support this feature for a long time already but it’s part of Android now. As I said, the interface is customized quite heavily and you can even customize it yourself quite heavily. For example, when you’re starting the device for the first time, the app drawer is missing. Instead, all apps are installed onto the home-screen directly. You can activate the app drawer in the settings though. In fact, you should go through the settings one by one because there is a lot to customize. There are a lot of apps preinstalled as well, maybe a bit too many. Huawei did include a lot of their own apps which you cannot remove. But there are the apps from Google and Microsoft preinstalled as well. Other preinstalled apps include Facebook, Instagram and Kids Corner. If you’re getting the LTE version of this tablet, then you will be able to make phone calls. There are standard phone and text messaging apps. In fact, it works just like with your Huawei phone. Since the tablet is quite big, it might be useful to use a headset though. By the way, GPS is supported as well. Let’s take a closer look at the battery life. Inside the MediaPad M3 Lite 10 is a battery with a capacity of 6600mah. In my battery test, I got a runtime of 10 hours and 45 minutes. I’m always doing the same battery tests by running an HD video at 50 percent brightness and with activated Wi-Fi. Compared to the competition, 10 hours and 45 minutes are good, but certainly not the best either. There are a couple of similarly priced tablets with a bit better runtime. In my day to day use the battery was fine. But, it didn’t last as long as the Lenovo Tab 4 10 Plus. I wrote down a kind of battery diary for a while. While doing that I got a total runtime of 18 hours. Out of those, I used the tablet actively for 7 hours. Since I’ve been using it with a keyboard, I had Bluetooth activated the whole time. The screen brightness varied between 50 and 100 percent. In those 7 hours, I used Chrome, worked with Microsoft Word and participated in a video call using Skype. I also watched YouTube for a couple of hours. It seems like the MediaPad M3 Lite 10 does not support any form of quick charging. Similar to Apples iPad, it takes a while until it is charged. I waited around 5 hours after the battery was dead to have it fully charged again. So, what’s the final verdict of my Huawei MediaPad M3 Lite 10 review? Well, it is a good tablet. While I wouldn’t recommend it to everybody, it can be perfect for some. I can’t recommend it if you plan to play a lot of high-end games. It could have been an awesome tablet, but the performance is really not the best here. But, it can be a very good choice if you’re looking for a tablet to watch movies and TV shows. Maybe on the sofa, in bed or even in an airplane. Thanks to its nice display videos look very nice and the sound quality is very good at this price as well. At the same time, the build quality is good too. Huawei MediaPad M3 Lite 10 Review:Thanks to its good speakers and pretty display, the Huawei MediaPad M3 Lite 10 is a great entertainment tablet with a good build quality. It's lacking performance due to the lower-end Snapdragon 435 though. Acer Switch 3 Review: The Best Cheap Surface Pro Competitor? Xiaomi Mi Pad 3 Review: An almost perfect iPad Mini clone?